This is truly a distinctive property with an exceptional provenance. This ultra luxury 2175 Sq. 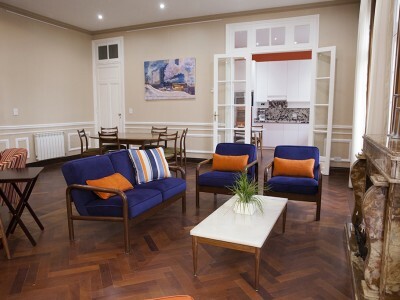 Ft. (202 m²) 4 bedroom and 3 bath apartment is located in Recoleta, one of the most desired neighborhoods in town. 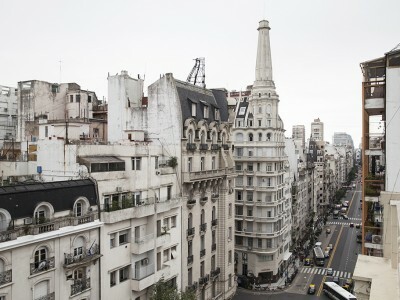 This area is the safest and unquestionably the most affluent, European zone of Buenos Aires, a fact that is mirrored by the stunning French architecture housing beautifully pampered residents. 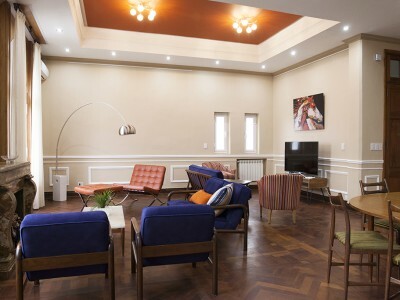 This elegant yet chic apartment occupies the whole 7th floor of a classic french-style building. It´s both a place to relax and to entertain guests. It offers plenty of natural light, hardwood floors throughout, Wi-Fi internet access, LED TVs, air conditioning and cleaning service. 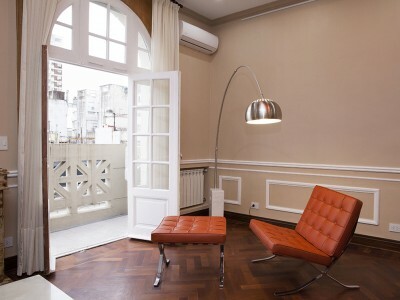 Just a few steps away from the apartment you will find "El Ateneo" the most famous bookstore in town, many restaurants, cafes, bars, clothes stores, among other shopping spots. It´s one of the most active streets in the city, at any time night or day you will find people walking around and enjoying the area. -LIVING ROOM: the enormous living room with hardwood floors has been decorated with sofas, armchairs, coffee table, LED TV. A beautiful decorative fireplace and really high ceilings add a special touch. The connected dining area has a wooden table with chairs. Includes: air-conditioning and access to balcony. -BALCONY: two sets of window doors open onto a large balcony. -GOURMET KITCHEN: modern and fully equipped kitchen make it an absolute pleasure to cook. The kitchen is complete with a large fridge and freezer, dishwasher, microwave, electric toaster, coffee maker, four-burner stove, and oven. There is also an LCD TV. Ample silverware, glasses, crockery and cooking utensils. -MASTER BEDROOM ENSUITE: A spacious and quiet space full of light. It has a King-size bed, large walk-in closets, bed-side cabinets and lamps. Air conditioning. Wooden floors. LCD TV in front of the bed. It has an ensuite bathroom. -BATHROOM: magnificent private bathroom, very spacious with rainfall shower, sink, heated towel rack, bidet, toiletries cabinet, and hair dryer. -SECOND BEDROOM: Also subtle and quiet space full of light, with a king-sized bed, large closets, bed-side cabinets and lamps. Air conditioning. -THIRD BEDROOM: Ample and full of light as the rest of the apartment. There are two twin-size beds, night tables and closets. Air conditioning. There is also a wood desk. 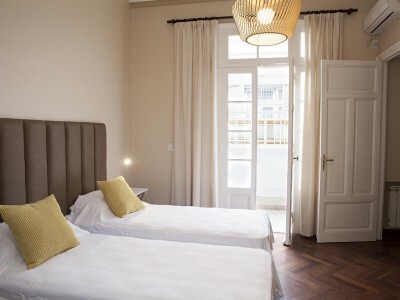 -SHARED SECOND BATHROOM: the second and thrid bedroom share a magnificent private bathroom, very spacious bathtub with shower, sink, heated towel rack, bidet, toiletries cabinet, and hair dryer. -FOURTH BEDROOM: Ample and full of light as the rest of the apartment. 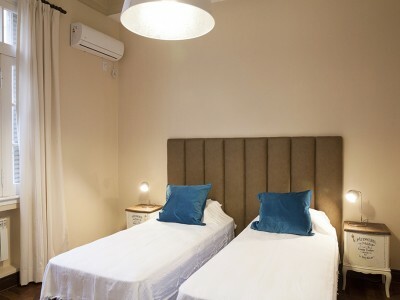 There are two twin-size beds, night tables and closets. Air conditioning. There is also a balcony. -THIRD BATHROOM: private bathroom, modern with shower, sink, heated towel rack, bidet, toiletries cabinet, and hair dryer. -LAUNDRY ROOM: adjacent to the kitchen are a washer and dryer for our guests’ convenience. This is a non-smoking unit. Smokers are kindly requested to smoke outside on the balcony. These rates are final in USD; they include: building expenses, local phone calls (control line for limited local calls), cable TV, internet Wi-Fi, electricity, water, gas, cleaning service once a week and taxes. 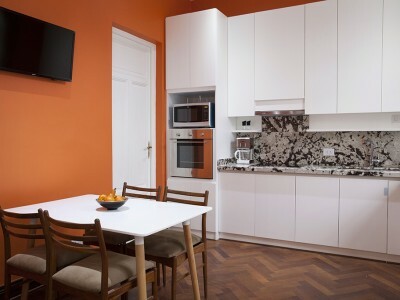 **4-night minimum stay required to book this unit. ** Please note: Rates from December 20th to January 5th are higher for this apartment.